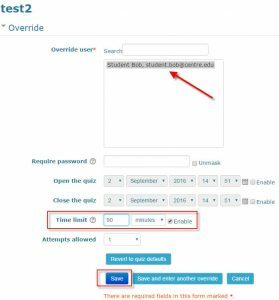 User Overrides allow faculty to give individual students additional time on quizzes or allow students to take the quiz at a different time. You have a student who requires extra time on quizzes. Click on the quiz you wish to grant the extension. 4. 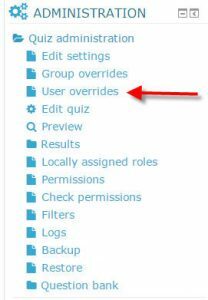 Select the student for whom you wish to create the override. 5. Then click enable next to the time limit and select the time and a half or appropriate value.